just over 50% of sell-side felt there was a lack of demand for mobile FX trading, whereas, the survey found that 38% of corporate clients who trade FX would use a mobile trading service if only their bank provided it. These imbalances represent ‘short-term’ opportunities for forward thinking regional banks to stay competitive and leap-frog their slower competitors by extending their single-dealer platforms to include a mobile FX distribution capability. 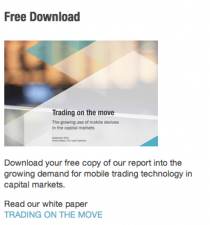 The white paper is available to download directly using this link: Trading on the Move.